Part 24 of Wonders of World Engineering was published on Tuesday 10th August 1937, price 7d. Part 24 includes a photogravure supplement showing the manufacture of steel, which illustrates the article Steel - From Ore to Ingot. 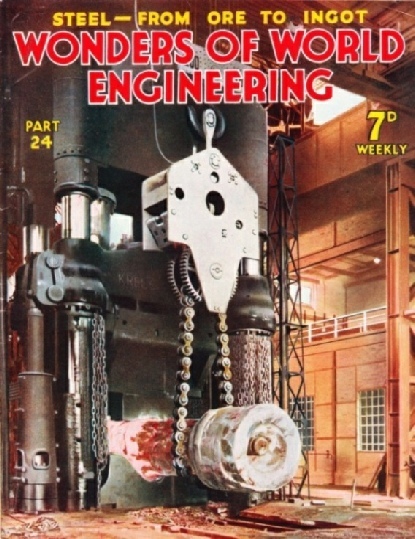 The cover this week gives a striking picture of a forging being shaped in a hydraulic press, a method which has largely displaced the steam hammer for heavy work. This press can exert a pressure of 15,000 tons. 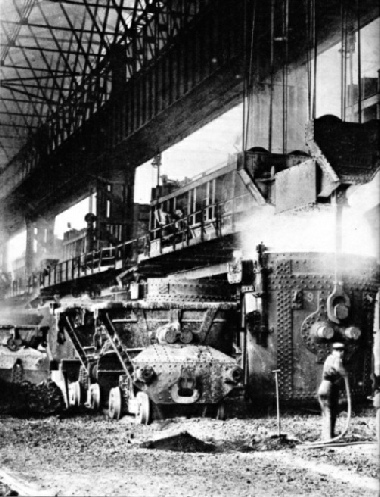 The photograph was taken in a modern steelworks at Dortmund, South Germany. This cover was later reproduced as the colour plate issued with Part 46, illustrating the article on Steel - From Ingot to Plate. The story of the construction of the Otira Tunnel, which took fifteen years to build through New Zealand’s Southern Alps. This chapter is by Harold Shepstone and is concluded from part 23. It is the sixth article in the series Below the Surface. You can read more on the Otira Tunnel in Railway Wonders of the World. 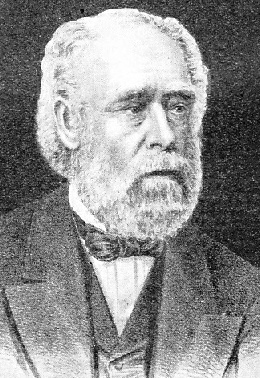 A pioneer of law and order in the mechanical world, Sir Joseph Whitworth raised accuracy in engineering to a new standard. His name is universally associated with the Whitworth screw thread, and he made many other striking contributions to engineering science. A much-prized distinction peculiar to the engineer is the right to append the letters “ Wh.Sc” to his name. This means that a Whitworth Scholarship has been gained by the man thus distinguished and indicates that he has had a thoroughly sound professional training. The scholarships were founded in 1869, by Sir Joseph Whitworth, who moreover left £100,000 to endow them so that the artisan and the student might be encouraged to pursue an organized engineering education. But the Whitworth Scholar is not the only reminder we have of this intensely practical engineer, for there can be few who have not heard of the “Whitworth thread”. Joseph Whitworth, born in 1803 at Stockport, Cheshire, was the son of a schoolmaster and had a good education, though it ended at the age of 14, when he went to an uncle to learn the business of cotton spinning. Having found this occupation not to his taste, he ran away to Manchester in 1821 and started work at the bench of an engineer’s shop there. Four years in Manchester were enough to show him that mechanical development was gravely handicapped by the want of reliable tools. London was then renowned for the excellence of its workmanship in this direction and thither he went, to work for a time with Henry Maudslay, as did James Nasmyth and some other young engineers afterwards to become famous. It was while Whitworth was at Maudslay’s that he worked out his first invention - the true surface plate, an instrument as vital to the engineer as the straight edge and square. The production of a true surface seems a simple matter but at that time it was one of considerable difficulty, and required an enormous amount of skill and patience. mechanical world. His measuring machine was an immense improvement on anything that had gone before. Most mechanics can detect by touch differences in size which are too minute to be read visually on an ordinary scale. Whitworth made a machine using this sense of touch and, by magnifying the readings by accurate screws and worm gear, made it possible to distinguish differences in size of as little as one-millionth part of an inch. Though this extreme degree of accuracy was not really called for, the measuring machine was useful for less exacting degrees of precision. Its utility was, however, not nearly such a boon to engineering as was the introduction of the Whitworth thread. Before this event it would be only by the merest chance that an inch nut, say, from one firm would go on to an inch bolt from another firm. Whitworth investigated the subject of screw threads with characteristic thoroughness and finally decided on a constant proportion between the depth of a thread and the pitch whatever its diameter might be. This was a real advance and in 1842 the Whitworth thread was formally adopted by the Royal Dockyard, Woolwich. From this start the system spread rapidly, penetrating many foreign countries, and it is still perhaps the most important of the many engineering standards. Whitworth concerned himself with tools exclusively up to 1854, but in that year, as he held the highest position as a maker of accurate machinery in Great Britain, he was called upon by the Government to set up factories for the manufacture of the Enfield rifle. Whitworth would not accept the task without finding out what was the reason for the want of uniformity in performance of this rifle. Having set up a range and carried out numerous experiments, he arrived at a solution and produced a rifle which, in 1857, proved much superior to the Enfield. But he met with nothing but discouragement from official quarters, and the same thing happened with regard to Whitworth’s valuable work in connexion with heavy ordnance. 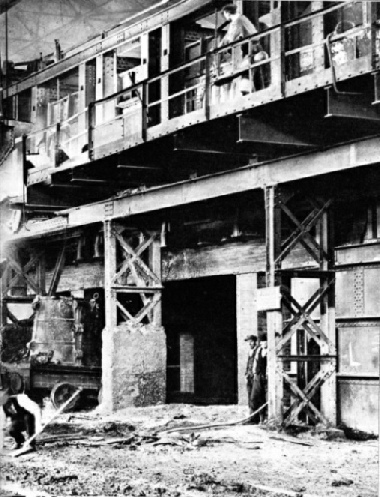 A notable contribution to engineering science was Whitworth’s development of compressed steel, that is, subjecting it to heavy pressure while it was still molten, with the object of getting rid of the sponginess which was then the bane of large steel castings. Other investigators had, however, been at work on this problem before him. Whitworth was a good business man and made large profits from his work as well as from training a number of good engineers. In addition to his generosity in the matter of the scholarships, Whitworth bequeathed £500,000 for other educational and charitable objects. He was created a baronet in 1869, and had been elected a Fellow of the Royal Society in 1857, Dublin and Oxford Universities conferring Doctorates on him in the same year. He was honoured by Napoleon III in 1869. Whitworth’s later years were spent in such pursuits as the breeding of shorthorn cattle, landscape gardening and so forth, in which he exercised the same thoroughness as he had done in his profession. These years were mainly spent at Stancliffe, near Matlock, Derbyshire. He died at Monte Carlo in 1887, having made many notable contributions to engineering history. This is the ninth article in the series on Makers of Engineering History. By the addition or elimination of various elements iron ore can be converted into steel of almost innumerable kinds. The processes by which steel is manufactured are among the most spectacular in engineering. Nearly all the great achievements of the modern engineer have been made possible by the development of two artificial products - steel and cement. The term “steel” is commonly associated with the hard material from which swords, knives, springs and pen-nibs are made: but to the engineer the bare term is meaningless, as there are so many different kinds of steel. The modern motor car alone demands the use of some twenty-five different types of steel, and innumerable variations of these types are possible. If we are to understand how present-day engineering differs form that of the days of Watt and Stephenson, we must know something of what the steelmaker is doing. It was the invention of the Bessemer converter in 1885 that revolutionized the manufacture of steel, but the Bessemer plant is not much used now in Great Britain. Its great rival, the open hearth furnace, was the invention of a British engineer, Sir William Siemens, although it was improved by the brothers Martin, of Sireuil, France. 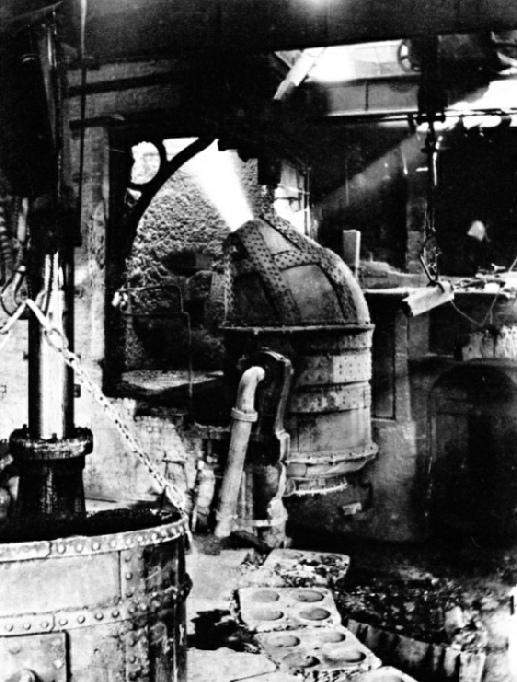 The Siemens-Martin furnace came into use in 1863 and is of enormous importance to-day. DEAD STRAIGHT FROM END TO END, the Otira Tunnel has a total length of 5 miles 445 yards and a continuous gradient of 1 in 33. It has a clear height above rail level of 15 ft 6 in and a maximum width of 15 feet. When the two headings met, it was found that the alinement was only three-quarters of an inch out, the difference in level being 1⅛ in. The disposal of the refuse of a large industrial town is a problem that has been treated in a variety of ways. In many place rubbish is now burnt in specially designed furnaces and used to generate electrical power. Rubbish has been described as “matter in the wrong place”. Some waste is inevitable in a civilized community, and the many unwanted remains of modern times must be disposed of. The story of refuse destruction may not appear to be particularly romantic, but it is one of tremendous importance, and modern methods adopted for disposing of all kinds of refuse and rubbish - from clinkers to tin cans - represent an engineering feat of no mean order. Special magnetic plant is used to draw out tins from heaps of garbage before it is fed to the furnaces of a refuse destructor. These tins are placed in hydraulic presses, squeezed into compact bundles and sold at about £2 a ton. In this part C Hamilton Ellis contributes a chapter on up-to-date methods of refuse destruction. THE BESSEMER CONVERTER is a large steel flask pivoted at the centre so that its mouth can be directed upwards or to the front. Molten iron is poured in and a blast or cold air causes the iron to become hotter by causing combustion in the presence of oxygen. First, the silicon burns and causes a red flame and brown smoke. When the carbon burns, a long jet of bright flame issues from the mouth of the converter. When the carbon is completely burnt, the flame disappears with remarkable suddenness. When the “blow” is finished, the converter is pivoted to the front and the metal is poured as shown in the colour plate facing page 172. THE INCOMING REFUSE is brought to the destructor in special enclosed containers with a capacity of 3¾ cubic yards. Two or sometimes three containers are mounted on one lorry. 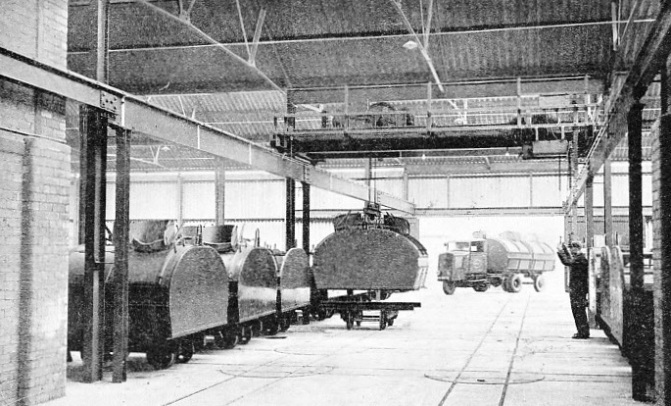 They are lifted by a crane on to bogies to be parked by a system of rails and turntables. When the refuse is required for incineration, the containers are taken by a telpher for discharge into the destructor. OPEN HEARTH FURNACES for the manufacture of steel, invented by Dr C William Siemens and improved by the brothers Martin, came into use in 1863. The open hearth furnace is a large closed chamber with a shallow saucer-shaped bed for the metal. At either end are ports for the admission of hot air and gases which form the fuel and burn over the surface of the metal. Furnaces of this type have a capacity of as much as 300 tons. The molten steel is poured from the furnaces into huge ladles handled by overhead cranes, as shown. 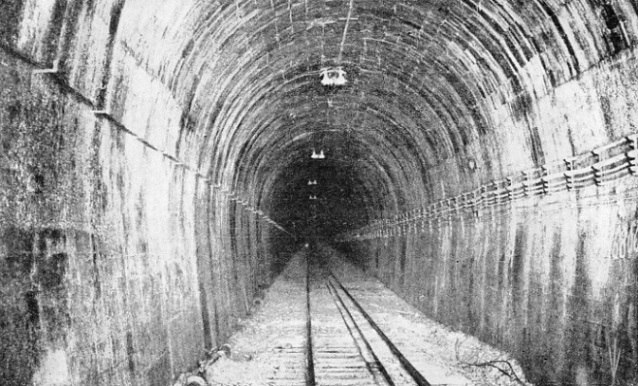 Great works of civil engineering, such as the cutting of canals and the piercing of tunnels, involve the use of large quantities of high explosive. Many different types have been evolved, some of which are easily stored and handled without danger. The engineer has sometimes to destroy Nature’s handiwork before he can exhibit his own genius. Many of the great engineering works in existence to-day would have been beyond the capabilities of man had he not mastered the mysteries of controllable power locked up in the seemingly harmless substances produced by his fellow-worker, the chemist. 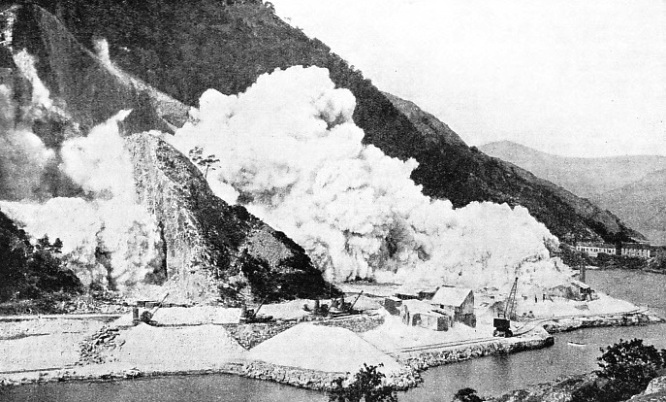 The cutting of the Panama canal, the piercing of vast mountain ranges - we cannot visualize the achievement of such triumphs without the use of explosives of various kinds. The engineers is chiefly concerned with detonating or high explosives such as dynamite, gelignite and blasting glycerine. The other group of high explosives, known as propellants, is used for firing projectiles, and does not often come within the scope of the civil engineer’s work. In this chapter F E Dean describes not only the types of work for which explosives must be used, but also the intensely interesting way in which simple substances, harmless in themselves, may be combined to produce some of the most dangerous compounds known to man. Materials latent with devastating power have been brought completely under control, and when we honour the engineer for the magnificent work that he carries out with the aid of explosives, we must give, also, full credit to the chemist for making possible the work of the engineer. CENTRAL CONTROL PLATFORM of an inclined rotary refuse destructor. The controls can be seen at the left of the photograph, near the ignition grate in which the refuse is fired. On an illuminated instrument panel are recorded the carbon dioxide content of the waste gases and furnace temperatures at the combustion grate and at the flue leading to the boiler. POWER FROM RUBBISH. This condensing turbo-alternator is driven by steam produced by the burning of refuse at Gjentofe, a suburb of Copenhagen, Denmark. 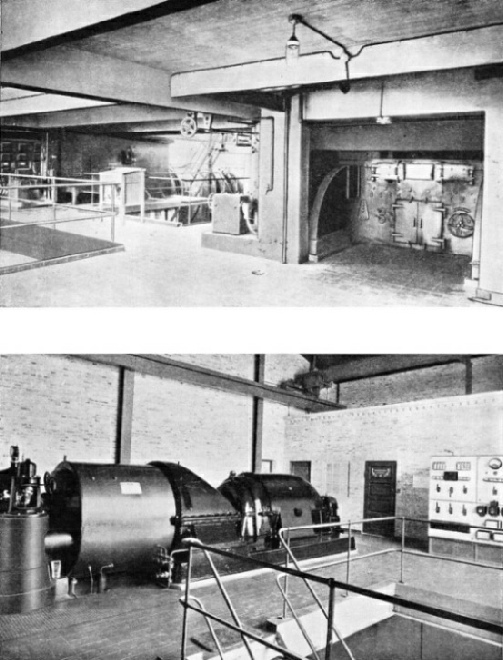 In this plant the output of steam ranges from 1 lb to 3 lb per pound of refuse burnt, when dealing with refuse of a net calorific value of from 2,000 to 5,000 British thermal units per lb. MOLTEN IRON for conversion into various classes of steel is tapped from the cupolas (or small blast furnaces) in which pig iron is melted. This photograph was taken in a steelworks at Letchworth, Hertfordshire. Steel castings are made here and more than 1,500 men are employed. TAPPING A BLAST FURNACE is effected by breaking down a plug of clay and sand in the bottom part of the furnace by an iron rod and allowing the stream of iron or slag to flow out. There are separate holes for the iron and the slag, and that for the slag being the higher, as slag floats on the top of molten iron. 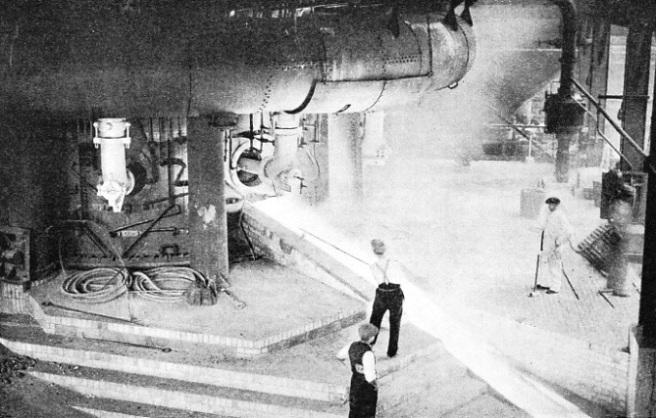 The large circular pipe is the main for the hot air; this is blown into the bottom of the furnace, by way of the bent pipes seen below the main, through water-cooled nozzles or tuyeres. ONE OF THE BIGGEST CHARGES ever used in Great Britain - twenty tons of gunpowder being detonated at Bonawe, on the shores of Loch Etive, Argyll, in 1931. This dislodged about 1,000,000 tons of granite from the mountainside. Gunpowder, or “black powder”, is generally used for blasting in quarries and mines, and for the making of fuses. Four large towns, more than two thousand farms and homesteads and a great network of modern motor roads now occupy what was once a swampy Italian wilderness with an area of 180 square miles. Close to the gates of Rome there is a vast area known at the Pontine Plain. In the early days of Rome this plain, once a marshy wilderness, was drained and inhabited by a prosperous agricultural community known as the Volsci. As Rome expanded the Roman legions exterminated the Volsci and overran the plain, which reverted to its primeval condition - a region of deadly swamps teeming with malaria. Early attempts to reclaim the Pontine Marshes came to naught, and it was reserved for Italy, under the guidance of Signor Mussolini, to achieve this task. Canals, pumping stations and roads were built, and new towns were founded. This great work is described by C Hamilton Ellis. This chapter is concluded in part 25. THE SQUARE AT SABAUDIA, a town which was officially founded by Signor Mussolini on December 18, 1933, and was built in less than nine months. Sabaudia is fifty-six miles from Rome, from which it is accessible by an excellent road. Near this town is Lake Sabaudia, four miles long. 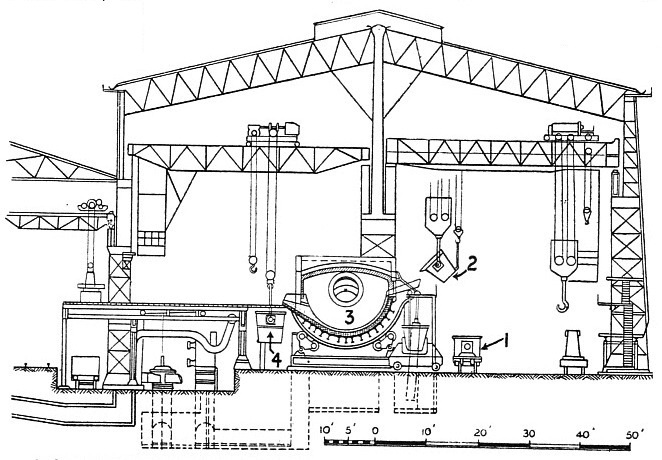 SECTION THROUGH STEEL MELTING SHOP AT MIXER. (1) Ladle of molten pig iron from blast furnaces on wheeled carriage. (2) Ladle lifted from the carriage and the iron being poured into the mixer. (3) Metal mixer, carried on rollers so that it can be tilted for pouring. The tilting is done by hydraulic cylinders. 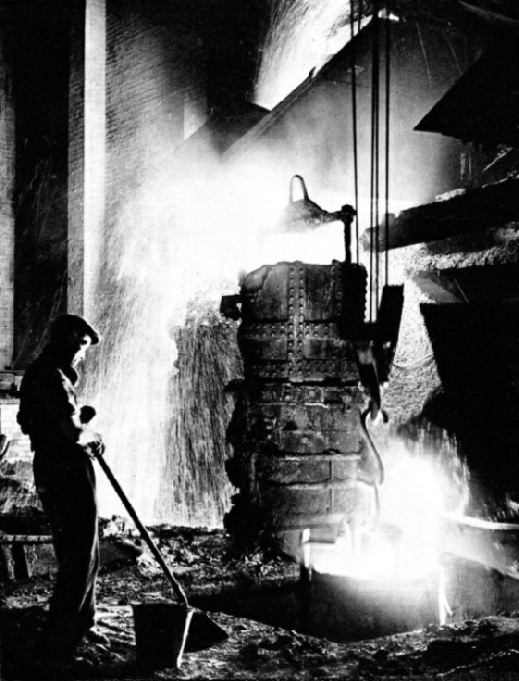 (4) Ladle into which the mixed molten iron is poured for transport by the overhead crane to the open hearth furnaces. SECTION THROUGH STEEL MELTING SHOP AT OPEN HEARTH FURNACES. (1) Coal bunker for gas producer. (2) Grab crane for charging the gas producer with coal. (3) Gas producer for heating open hearth furnaces. (4) Duct from gas producer to furnaces. (5) Containers for furnace charges. (6) Revolving charging machine which empties the charge into the furnaces. (7) Ladle of molten iron from the mixer. This is the same as No. 4 in the drawing above. The metal is poured into the furnace through the charging hole when the charging machine is withdrawn. (8) Open hearth furnace carried on rollers for tilting during pouring into 9. (9) Ladle which receives the molten steel. This ladle does not tilt, but is provided with a valve in the bottom through which the steel is drawn off into 10. (10) Ingot mould carried on wheeled carriage. (11) Slag ladle. The furnace is emptied of slag through the charging hole.